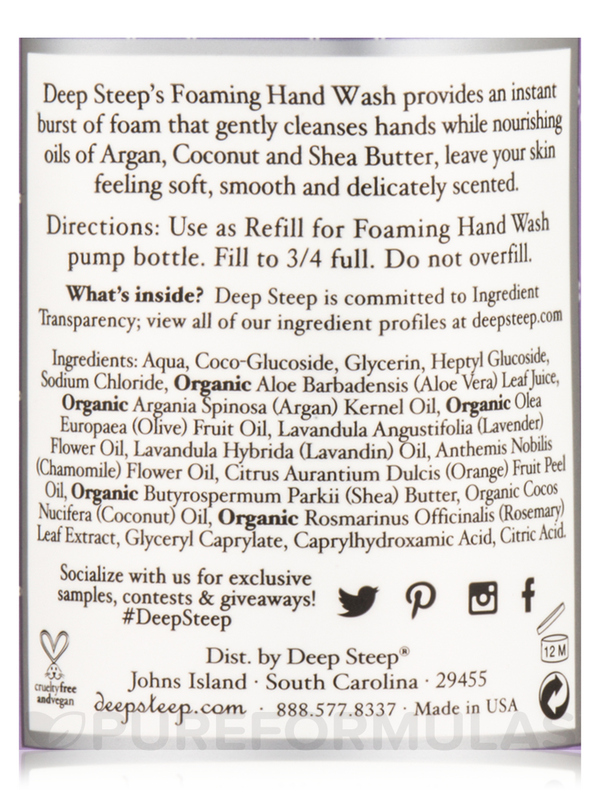 I didn't try the product because when I received Foaming Hand Wash Refill, Lavender Chamomile by Deep Steep the ingredients on the bottle were completely different then they were listed online. Clean - Pure - Natural! Deep Steep's Foaming Hand Wash provides an instant burst of foam that gently cleanses hands‚ as natural extracts leave skin feeling soft and smooth. Aqua‚ coco-glucoside‚ glycerin‚ heptyl glucoside‚ sodium chloride‚ organic aloe barbadensis (aloe vera) leaf juice‚ organic argania spinosa (argan) kernel oil‚ organic olea europaea (olive) fruit oil‚ lavandula angustifolia (lavender) flower oil‚ lavandula hybrida (lavandin) oil‚ anthemis nobilis (chamomile) flower oil‚ citrus aurantium dulcis (orange) fruit peel oil‚ organic butyrospermum parkii (shea) butter‚ organic cocos nucifera (coconut) oil‚ organic rosmarinus officinalis (rosemary) leaf extract‚ glyceryl carpylate‚ caprylhydroxamic acid‚ citric acid. Cruelty-Free / Vegan / Vegetarian / Made in USA. Use as refill for foaming hand wash pump bottle. Fill to 3/4 full. 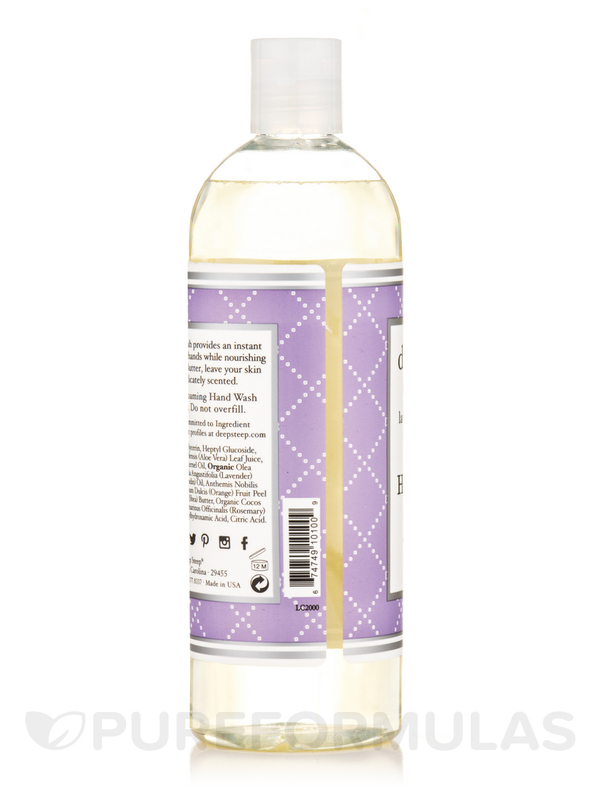 This Foaming Hand Wash Refill, Lavender Chamomile by Deep Steep is the first hand wash I have found that doesn't dry out my hands. It is also very good quality and pure.